Windows XP is probably Microsoft’s biggest success story for Windows. It has been around for about thirteen years, been the number one operating system for much of that time, now it is number two. It is still more popular than Windows Vista, Windows 8.x, Mac and Linux in the Desktop arena. 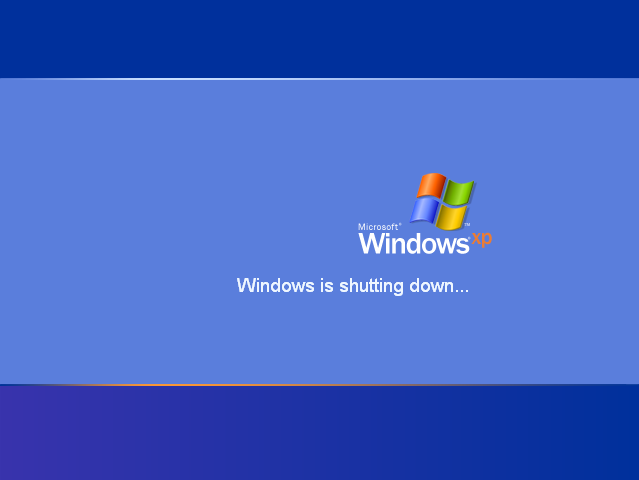 Now Microsoft says it’s time to say good bye to Windows XP. It first became available to purchase in 2001. Unlike its predecessors it was much more visually attractive, with its brightly coloured windows and task bar and pleasant photo (Bliss) for a default background, rather than a plain colour. Apart from that it was much like Windows 2000 with a couple of extra features such as Windows Movie Maker, which first appeared in Windows ME. Like many fledgling operating systems, Windows XP had a number of issues. Firstly like most of Microsoft’s new software, it was heavier than all the others that had come before it, however it did claim to boot faster than some of the other ones, which I think it did, if you compared it to Windows 2000. Secondly it was incredibly buggy and unstable, this meant many organisations backed off it for a while until it had matured. Internet Explorer 6 also was a bit of a drawback to Windows XP, it did things differently to other browsers, therefore web developers had to adapt to support it. Additionally IE6 never passed the Acid 3 security test. Ironically IE6 became one the longest living and popular browsers the world has ever seen, it is still used today by some organisations. Later Microsoft created Internet Explorers 7 and 8 for XP which helped a lot, but they are still no match for other competitive browsers such as Mozilla Firefox, which also supports XP. This is a drawback that never ever went away from Windows XP and has been in every version of Windows and Office since. Windows activation was installed to try and prevent software piracy, instead it has appeared to have caused more problems than it has solved. It has not stopped people using unlicensed copies of Windows. Instead it makes setting up a genuine versions of XP a pain because the system sometimes thinks it is not genuine. You then have to waste time ringing up Microsoft up to resolve the issue. Once some of the major bugs had been addressed for Windows XP and hardware had moved on to have better native support, XP became one of the most popular operating systems in the world. Even when Windows Vista came along, it was no match for XP with its new reliability making it very popular in organisations and in homes. This was something Vista never really achieved. It appeared that nothing could get in its way of XPs success, until the arrival of Windows 7 in 2009. Windows 7 did everything XP did and a bit more. 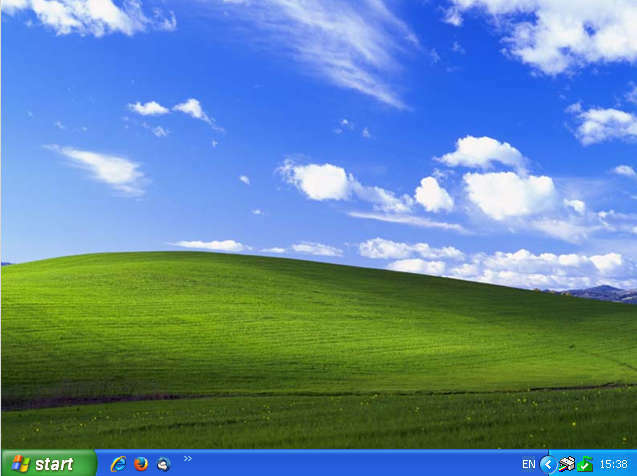 Today Windows XP is the worlds second most favourite operating system, with Windows 7 at number one. It massively out performs Microsoft’s new Windows 8, in terms of popularity, which is proving a bit of a “flop” for Microsoft. 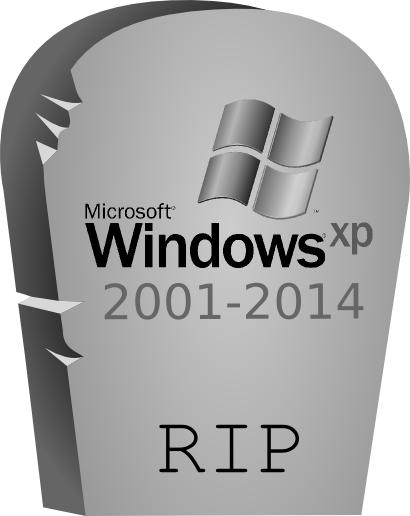 Next month after about thirteen years of support, Microsoft will lay Windows XP to rest. 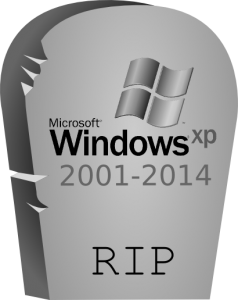 After April the 8th 2014 Microsoft will stop providing security updates for XP. Therefore you have a potential security risk if your computer is still running XP. Microsoft has their own update guide here, but it does not factor in the free Linux option or if you have more brass than sense the Mac option. Users used to Windows XP will probably find it easier to adapt to Windows 7 rather than Windows 8 which adopts a completely different interface. To get a computer with Windows 7 you’ll probably need to visit a specialist computer store or buy second hand. Buying second hand is a cost effective way of getting a new computer that does everything you need it to do, with minimal hassle, making it a great choice for many users coming off Windows XP. Choosing Linux … it’s Free! 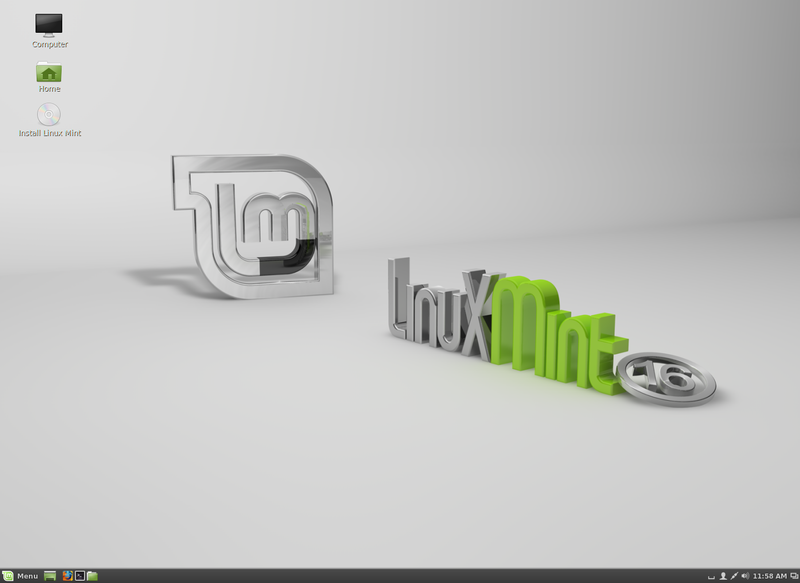 To find out why Linux Mint is a good choice of operating system, take a look at this. Linux Mint can be acquired from here. If you have a particularly old or slower computer you may find Lubuntu to be a fast and functional system that will do pretty much everything any other modern computer system will. The only drawback is it does not look as pretty, but is still easy to use. You can find out more about Lubuntu here. Thank you James, you’ve made my day!